This affects all of us! Whether you have a job or are jobless; whether you are a student or retired person; a member of a union or have no union. The majority of working people in this country make less than $15 an hour which means that thousands upon thousands of workers live either in poverty or close to the edge – while the corporate elites, the 1% are reporting billions in profits. 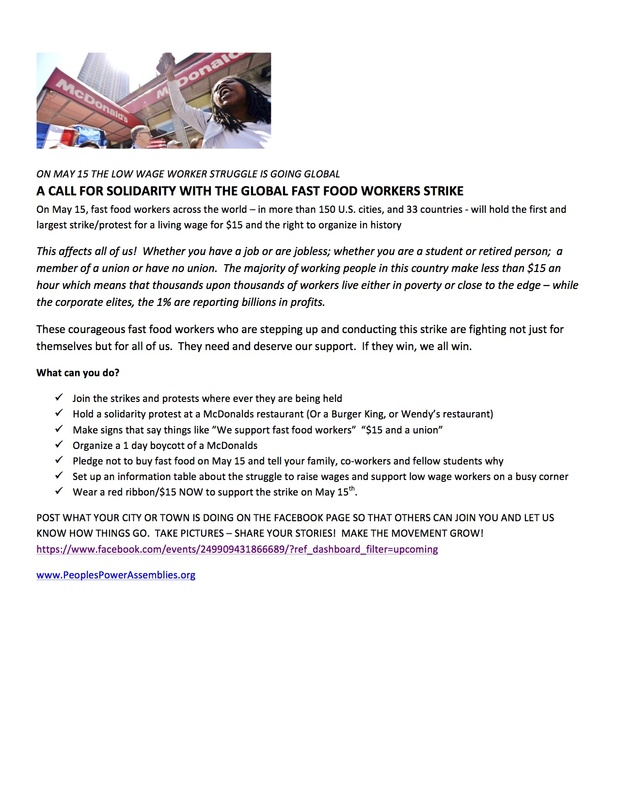 These courageous fast food workers who are stepping up and conducting this strike are fighting not just for themselves but for all of us. They need and deserve our support. If they win, we all win. -Wear a red ribbon/$15 NOW to support the strike on May 15th. POST WHAT YOUR CITY OR TOWN IS DOING ON THE FACEBOOK PAGE SO THAT OTHERS CAN JOIN YOU AND LET US KNOW HOW THINGS GO. TAKE PICTURES – SHARE YOUR STORIES! MAKE THE MOVEMENT GROW! -10 A.M. McDonald’s at Herald Square, 34th & Broadway. 212-633-6646. Facebook Event. -Baltimore – Walk 4 Justice Gather 4 P.M. at McDonald’s, Light & Baltimore Streets, downtown Baltimore. 410-218-4835; Facebook Event.